WIND NEWS surf magazine » Follow Wavesailing South americans ONLINE TV.. Follow Wavesailing South americans ONLINE TV..
Pubblicato il 21 Aprile 2011 in news. 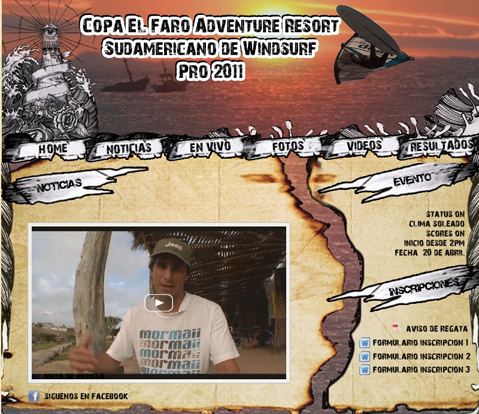 http://www.surfperu.tv/sudamericano_windsurf al link “EN VIVO”. Oggi sono previste onde sui due metri, mentre domani potrebbe essere un venerdì… da leoni! This is a big effort from us to share this event with a TV production with about 10 people to film here a movie about the event. Today we will have up to 2 meter height waves (500-1000 meter long) and hope Friday double height double long. 07/10/2013: PWA Sylt World Cup 2013... the end!